Majortests.com provides practice tests and resources for high school, college and graduate tests. We have a no-nonsense approach to test prep and give you access to a large number of practice tests and questions written by test prep professionals. 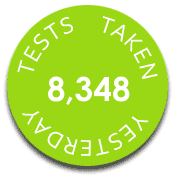 Our practice tests are free and there are no user names to create and no passwords to remember. If you need help preparing for the tests or gain a deeper understanding of a subject, you can go through essays on select topics. Various types of essays like compare and contrast, expository, and argumentative essays will help you expand your understanding as they provide different perspectives and detailed analysis. Armed with this, you'll be better prepared to tackle tests. Last month, our free practice tests were taken over 209,000 times and we received 2,450,000 page views from 160,000 unique visitors. We have example essays about every essay topic - 200K of them!! * SAT is a registered trademark of the College Board, which was not involved in the production of, and does not endorse, this product. * GRE is a registered trademark of Educational Testing Service (ETS). This website is not endorsed or approved by ETS. * GMAT is a registered trademark of the Graduate Management Admission Council, which was not involved in the production of, and does not endorse, this product. * Miller Analogies Test is a registered trademark of The Psychological Corporation. This website is not endorsed or approved by The Psychological Corporation. All content of site and practice tests copyright © 2019 Study Mode, LLC.